Details about the blue carpet event and opening ceremony have emerged. On Sunday 6th May, all 43 participating countries at this year’s Eurovision Song Contest will be officially welcomed to host city Lisbon as the blue carpet event takes place. As the theme of the contest revolves around the ocean, the organisers have chosen a blue carpet as opposed to red. The event is set to take place by the riverside next to MAAT (Museu de Arte, Arquitetura e Tecnologia). It will start at 17:00 local time (18:00 CEST) and will be broadcast by RTP1. Hosting the event will be Cláudia Semedo, Inês Lopes Gonçalves, Pedro Granger and Pedro Penim. Eurovision 2018 blue carpet ceremony will take place next to MAAT. Image source: Fernando Guerra, MAAT. The 63rd Eurovision Song Contest will take place in Lisbon, Portugal next year. The contest is to take place at the Altice Arena. The first semi-final will take place on 8th May, the second semi-final on 10th May, and the Grand Final will take place on 12th May. This is the first time Portugal has hosted a Eurovision event. The official slogan for next year’s contest is “All Aboard!”, and was chosen to represent a celebration of Europe and music. 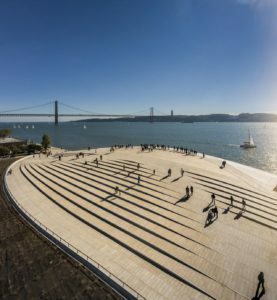 The slogan was inspired by Lisbon’s longstanding history as an important global seaport and the importance of the ocean in Portugal’s history. The ocean has connected Portugal to the rest of the world for centuries, and this connectivity is intended to invite people from across the world to come together to celebrate music and Eurovision.